There is no one way to make it in photography. If you’ve ever heard the saying there’s more then one way to skin a cat, well that’s how photography kind of is. There are many avenues that can bring you money and the more of it you have the more time you’ll be able to spend behind the camera. In theory of course. But what about big projects? How important is it to have a photo project that lasts longer then a week, a month, a year? I’ve been fortunate to have had a couple of these over the short time I’ve been a photographer and I can say that while the results have always varied, the stories that come from these big projects are the ones I tell the most often. 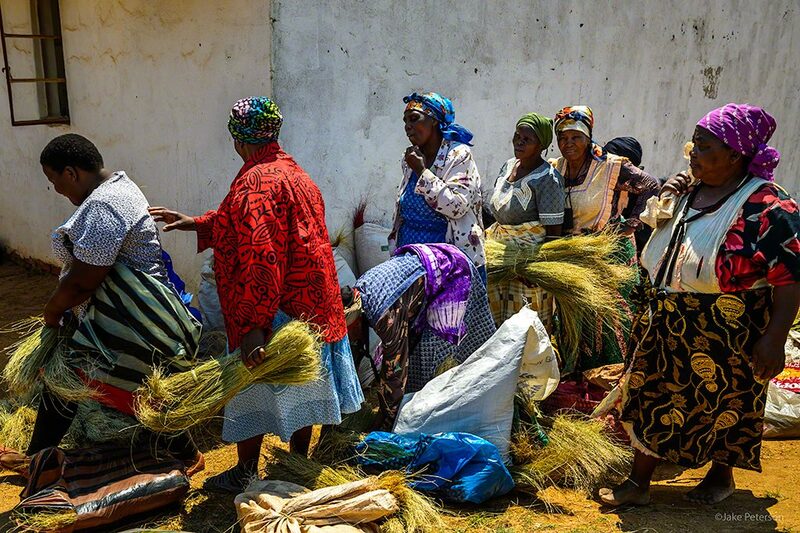 From working with African Artisans, to traveling the country with a flying museum, those big projects have made a bigger impact on my life then many of the day shoots I’ve been on. From a business stand point do they pay off and are they worth investing in? When you have a big project you have to spend a lot more time prepping for it. That’s the big difference I’ve noticed. The benefit is all that prep work can help your photography in all the other little projects you have going on. Whether it’s learning more on the computer, getting better with flash, learning new camera techniques, or working more with people. Whatever it is, odds are it will be beneficial later on. So yes I am a believer in big projects but like all aspects of life you need a balance between the big and the small. The satisfaction of completing even the simplest of tasks helps make everyday life better. In photography you really really need that feeling of completion to help stay on track because it’s easy to loose sight of why you’re doing all of this. Today is a day to honor the many sacrifices that were made many years ago. Seventy Two years ago, May 8th 1945 was declared VE Day, Victory Europe. The end of WWII in Europe had begun with the German surrender and while the war continued on in the Pacific and peace was not entirely secured yet in Europe, the end was in sight. Today is an important day to remember that hard fought victory. WWII changed the lives for everyone. It was the second time in the same century that the world was engaged in conflict and sadly it was not the last time that nations were fighting each other. Kids and adults had to fight to secure peace. It was not an easy victory, it took time and many lives. As we go through these uncertain times now, let us not forget the past and most certainly not repeat it. 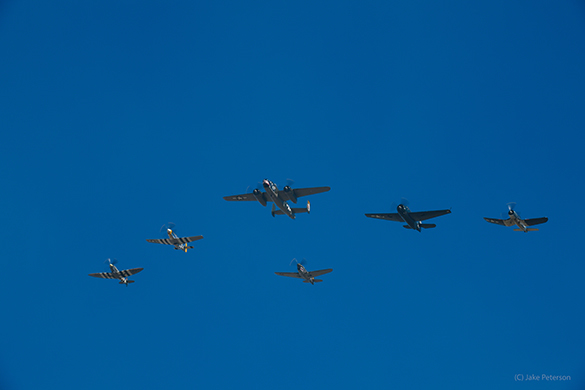 Two years ago, I had the privilege to document the Arsenal of Democracy Flyover, in which 52 aircraft flew over the nation’s capitol in honor of the 70th anniversary of VE Day. 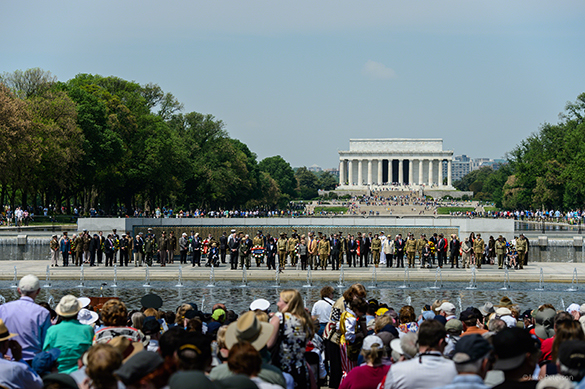 Over 800 veterans and 30,000 people were in attendance at the national mall. 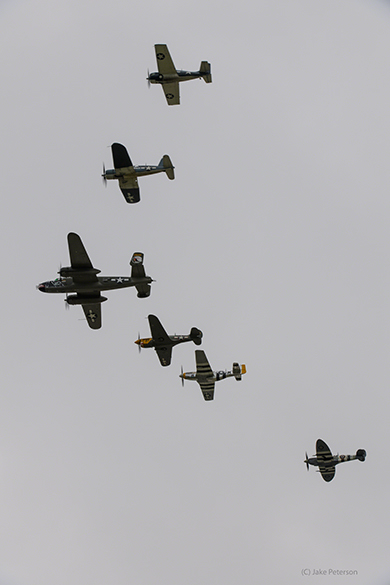 The Texas Flying Legends Museum brought eight aircraft in support of the flyover. This is what it was like for them. Among the performers at Wings Over Houston was the Texas Flying Legends Museum. 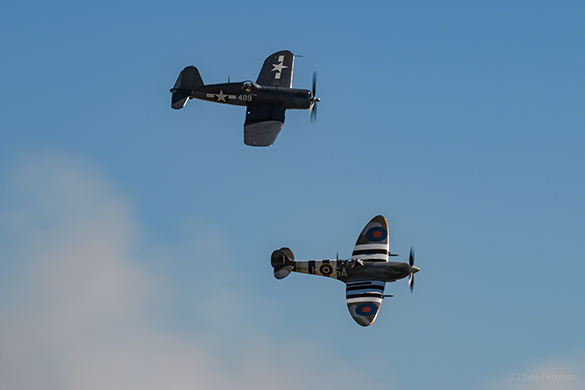 Their routine of six WWII warbirds flying bombing and straffing runs across the field always leaves the crowd in awe. Combined with their flying is the pyrotechnics that literally make people jump back. Photographing this group is a cinch. With the D5 and 200-400 VR it all comes down to good panning. Twisting at the trunk and smooth follow through. Wings Over Houston has Arrived! This weekend is the Wings Over Houston Airshow which is one of my favorite airshows and is one of the last in the circuit for this year. 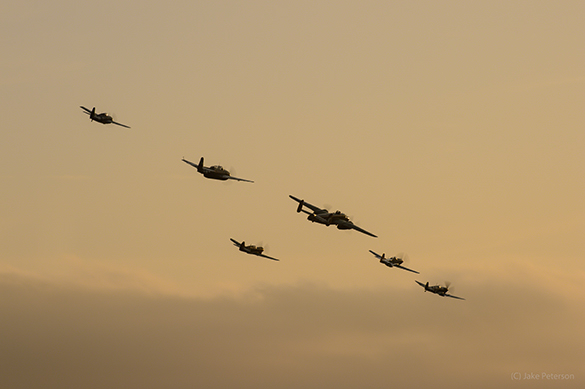 While the planes have gathered up today the shows starts tomorrow. This two day airshow is jammed pack with performers, planes and reenactors. 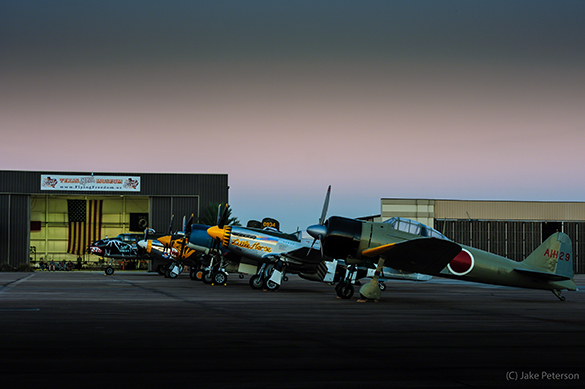 One of the main sponsor is the Texas Flying Legends Museum which will be performing this weekend. If you’re in the area I highly recommend coming over to Ellington Field to have some fun. A Great Start to Atlanta Warbird Weekend! 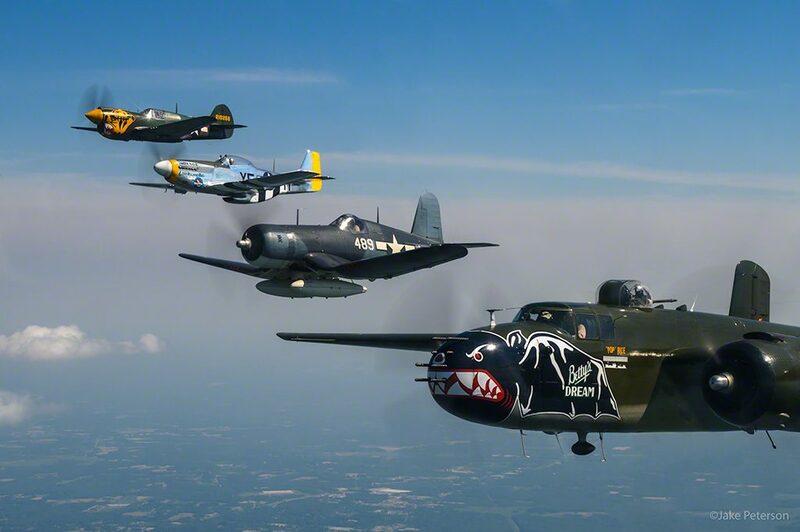 I’m down in Atlanta this weekend for the Atlanta Warbird Weekend being hosted at Dekalb Peachtree Airport in honor of the 75th Anniversary of the American Volunteer Group. The Texas Flying Legends Museum brought their two P-40’s down for the weekend piloted by Bernie Vasquez and Steve-o Hinton. The planes and crews arrived yesterday bringing the total up to 3 so far. With more on the way the weekend is shaping up to be a good one. But Frank has already made the trip worthwhile. Frank Losonsky was a crew chief for the AVG’s in China before working on a C-47 flying over the hump. Frank, although not very expressive, was having one heck of a time as no sooner as the two P-40’s landed, Bernie prepped the P-40E to fly Frank around Georgia. The two were up for a good 40minutes before coming back down for an interview with a CNN crew. His family was thrilled to see Frank get so much attention and Frank while not all smiles was loving every minute. Honoring guys like Frank is what makes aviation so wonderful to be a part of. Airventure 2016 was a blast! Back home at the office now and loving going through the 30K images I took at Oshkosh. It’s a fun process. 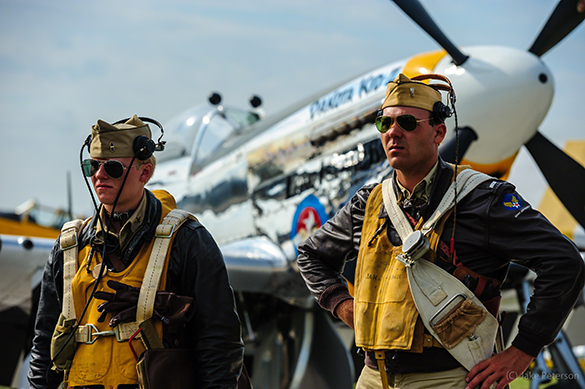 EAA Airventure offers a lot of different events to enjoy. Each year is different but each time you leave feeling like you need a vacation because so much goes on. The Texas Flying Legends Museum made their debut on Wednesday with a performance that afternoon. The group had a big crowd as they were working on the Mustang which had a bad magneto after they landed on Tuesday. It prevented the Mustang from performing but gave everyone a chance to see the inner working of the Mustang. While standing in Warbird Alley it was interesting to watch as everyone swarmed around the open plane. Thursday’s performance was back to their usual routine with six ships flying and pyro going off. 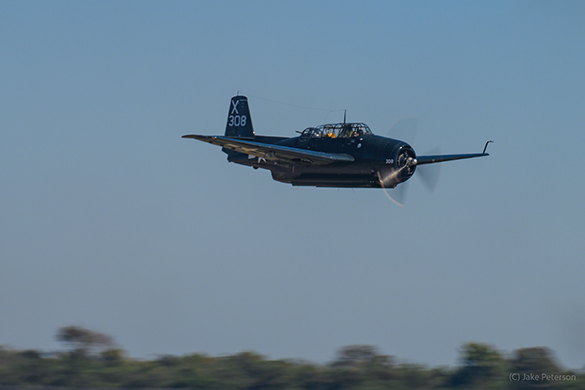 This year has been a bit different without the Zero and Corsair but Oshkosh saw the return of the Corsair which was the star at Sioux Falls Airshow the weekend prior. 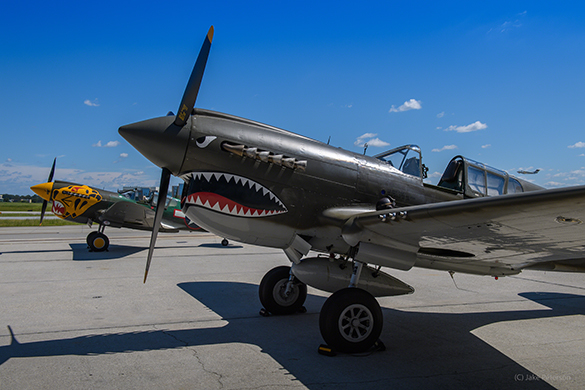 Amongst the popular of planes in Warbird Alley, the museum’s Spitfire MkIXc drew a crowd every day. The first day I had the pleasure of speaking with some folks from England who were more enamored with the Mustangs the Spitfire. It was quite interesting to hear the role reversals of popularity amongst planes. If there is one thing that the crowd at Airventure enjoys more then the planes it’s the pyro. When those explosions go off everybody is standing up. It doesn’t matter which plane is flying to enjoy the boom. I had the rare opportunity to go out onto the pyro line to photograph TFLM’s performance. Shooting with the D5 and 24-70 f/2.8 I tried to capture the perspective of a soldier on the ground during a straffing run. 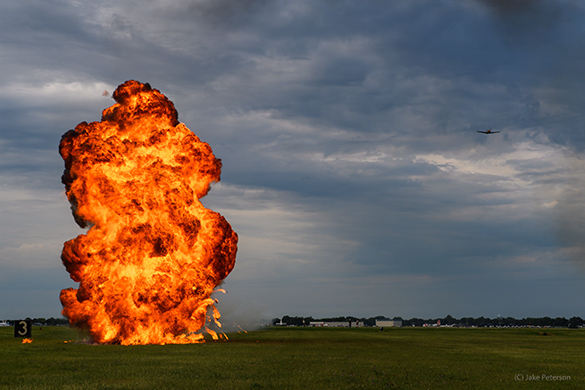 Between the heat of the flames, the percussion of the blast and the force pushing me back, the feeling of those planes coming in on a straffing run felt very real. The overall event was an absolute success with pilots and attendees leaving happy. Airventure is always a year of anticipation with a couple weeks of excitement and then thrill is over. It’s amazing how fast it goes by every time but seeing the awesome planes and meeting all the wonderful people makes it worthwhile every time. The one thing that there is more of at Oshkosh then planes is people. It’s really a pretty amazing place to have thousands of aviation enthusiasts show up for the week. 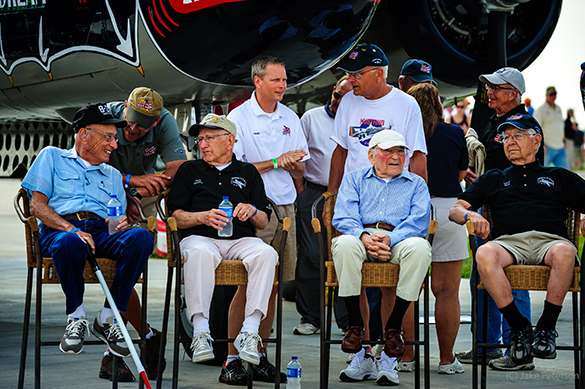 Not just fans but pilots, historians, re-enactors, and of course veterans. They all have stories and it’s impossible to hear them all. When it comes to the people shots I don’t in any ways consider myself an expert. But what I can say is that the best moments are often the ones that aren’t scripted. There are of course the events that are meant to bring people in. Then are those candid shots that you only see by watching the people enjoy the show. 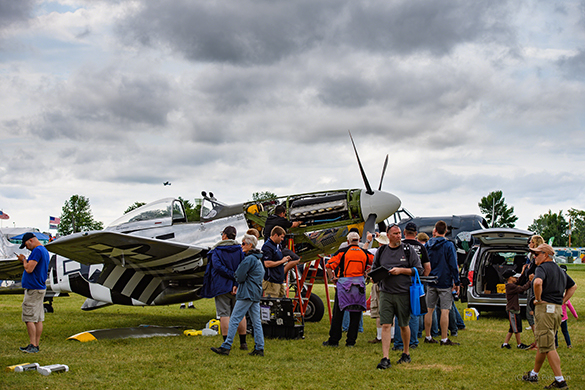 That’s one of the great things about EAA Airventure is that you can just stop and people watch. My favorite combo in the past and will be slightly upgraded this year is the D5 and 200-400 VR. The 70-200 VRII works well too but the 200-400 allows you to zoom in and isolate those moments between the crowd and the planes. As opposed to taking everything in you then isolate on just those candid shots. The two images I posted are exceptions to this, these were both captured with the 70-200. Why did I post them? Well I love seeing the re-enactors who are devoted to their craft and the veterans who come out to tell their story. It’s been such an interesting week that I haven’t had time yet to go shooting with the D5 but this weekend is another story. I thought why not post one last shot from the trip back to North Dakota this past week with the Texas Flying Legends Museum. 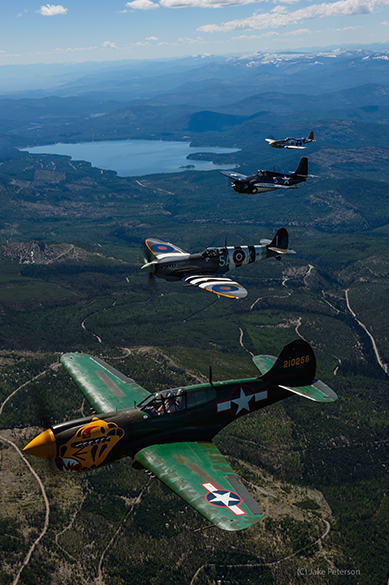 The four fighters were grouped up as we made our way across Idaho and into Montana. 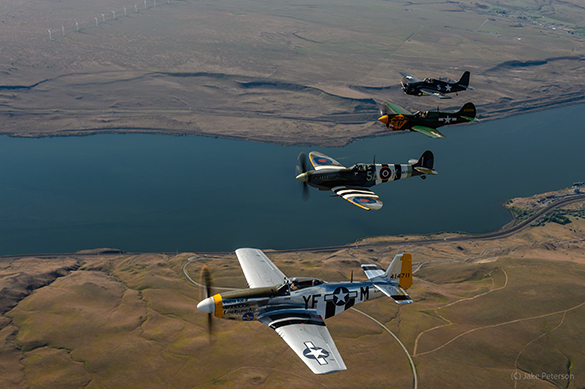 On the way back to Minot this past week the Texas Flying Legends Museum’s aircraft took a northern route through California, Oregon, Idaho and Montana. Along the way we passed over some absolutely beautiful scenery. We reached our destination in the early afternoon, Glacier National Park. 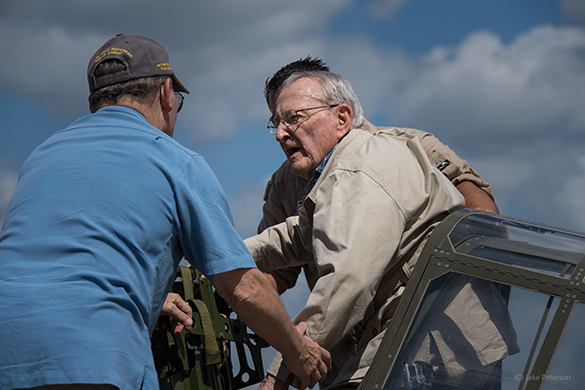 This once in a lifetime opportunity added another chapter to the history of the aircraft and for some of the planes recreated history. The Mustang, Spitfire, and P-40 all have history at some point of being over mountains and snow which made this flight very special. It’s was a great trip down to Chino, CA and back with lots of photos and stories to share. The Planes of Fame Airshow was a huge success with the Texas Flying Legends Museum making their debut performance one to remember. The fleet is back home in Minot for maintenance for the next couple months before setting off again for the next airshow.